I didn't walk away empty handed with yesterdays visit to Superdrug, one can't help being a make up addict and as soon as I saw '3 for 2' I was sold. I have been wanting to get the Revlon 'Facets of Fuchsia' polish for ages, but it's always been sold out, finally it's mine! It has a black base with tiny fuchsia glitter particles along with hexagonal glitters. It's totally gorgeous, and I can't wait to wear it. I have never paid attention to the 'Sleek' powders before, but after 1 swipe of the 'Luminous powder' in shade 2 (perfect for NC35 Skin tones) it had to be mine as the colour match just seemed spot on. But, once you apply it to the skin it almost disappears. I'll let you know if it performs as nice as it looks in a forthcoming post. Now, the brow kit is what I intended to get as it's brilliant. It includes a powder, wax, brushes and tweezers all combined in a compact that includes a mirror. I was sent the darker shade a while ago and have used it everyday since. However, even though I'm brunette I found the dark wax to be too harsh on my face, so I went out and got myself the lighter shade which I prefer. See swatch comparisons below. On the subject of 'Sleek, I don't know how I found the time, but I depotted my Sleek eyeshadow palettes to potentially get more use out of them, and now they sit comfortabley with their other brands of eye shadow friends. Lastly I'm wearing Orly's 'Sweet Peacock' on my nails, it's a shade I was sent from their recent 'Birds of a feather' collection. It's a foiled blue that's shot through with silver and has a matte finish, as much as I like it, it's not my favourite from the collection. Plus, yesterday my friend said it was a smurf blue, which I totally agree with however, I'm not sure if that's a good thing. My favourites from their recent collection has to be 'Fowl Play', 'Nite Owl' and 'Sea Gurl'. Do you own any of the 'Bits 'n' bobs' I mentioned? If so, what are your thoughts? Such a good idea to depot the Sleek palettes. I'm loving that Revlon nail polish. I can't resist hexagonal glitter or glitter nail polish in general. I'd love to try the Sleek eyeshadows (and blushes). WIsh they were available in stores here in the US. Last time I checked, it was only available online. love the look of the brow kits!. Facets of Fushia is a gorgeous nail varnish but it is an absolute 'mare to get off. Just last week I picked up Facets of Fuchsia and I'm in love! Lovin' the Orly polish you got, such a pretty colour. The Revlon polish looks really pretty but I love your peacock colored nails. I love my brow kit, I use Benefit's and I really don't know how I ever went without filling in my brows- it makes such a huge difference! I have the Brow Kit. I'm not entirely convinced by it though as even the palest one is a little dark for me (ghostly white and blonde!). And being slightly oily sometimes the wax can smudge a bit if I touch my brows - not the best look! But a great price and great for traveling though. And as others have said Sleeks Contour Kit is amazing! Oh that Orly polish looks so pretty. I've never tried Orly before ever! Must fix that. Facets of Fuschia is one of my Christmas party staples for this year I think! Ahh i want Facets of Fuchsia but its never in stock, dont even think they sell it in my local store! its so pretty. 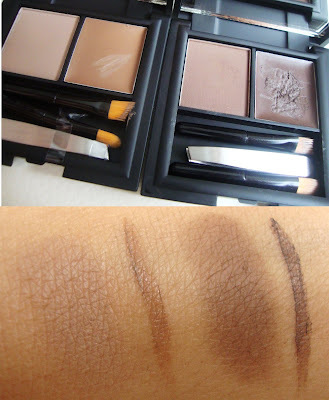 I might try the brow kit too, I am fairly dark too but the dark one looks much too dark for me. I've been wanting to get a brow kit for ages, will have a look for that during my weekly boots/superdrug shop!! i have that nail polish and its looove!! I'm so tempted to try out Sleek cosmetics! i think your post is the final push! I am a nail polish addict and love the Revlon Facets of Fushia. Looks so GORGEOUS!!! Anyway I have recently purchased a great deal and would like to share it with you because it is simply amazing if you love nails like me..!! Is £12 for a manicure and pedicure finished with Shellac long-lasting nail polish which last up to two weeks!! Normally costing £50 for both!!! so 76% discount...!! I don't know about you but I get so many compliments when I'm wearing Facets of Fuchsia.